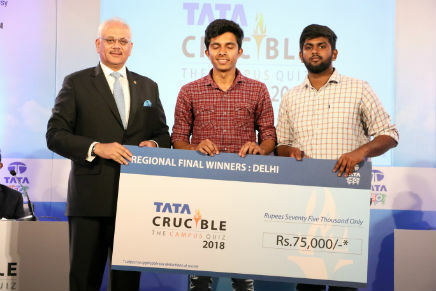 Delhi : Shri Ram College of Commerce wins the Delhi Tata Crucible Campus Quiz 2018.JPGNew Delhi, March 20, 2018: Hari Krishna AS and Ashik A. from Shri Ram College of Commerce decimated their opponents to win the Delhi edition of Tata Crucible Campus Quiz 2018. A total of 84 teams battled it out in the city level finale for the top honours, held at Vivanta by Taj. Hari and Ashik took home a cash prize of Rs. 75,000* and will compete in the zonal round to qualify for the national finale. Bramhdeep Singh Jakhar and Ankit from Delhi Technological University were declared runners-up, winning a cash prize of Rs. 35,000*. Mr. Rohit Khosla, Senior Vice President – Operations, The Indian Hotels Company Limited (IHCL) was the Chief Guest at the finale.